1. Quarter the lemon lengthwise, removing any seeds. Thinly slice crosswise into small wedges and add to small pot of boiling, salted water. Blanch for 2 minutes and drain. Reserve slices. 2. In a saucepan, whisk together lemon juice, orange juice, oil, mustard, honey, salt, bay leaf, red pepper flakes and black pepper to taste. Bring to a boil and simmer for 5 minutes. Let cool. 3. Put chicken in a bowl and add honey mixture. Add carrots, onion, dates, thyme and blanched lemon slices. Turn mixture several times to coat. Let marinate for at least 30 minutes at room temperature, but preferably overnight in the refrigerator. 4. Heat oven to 425 degrees. Transfer all ingredients, including marinade, to a sheet pan with a rim. Chicken should be skin side up. Roast until chicken is browned and cooked through, about 20 to 30 minutes for breasts and 30 to 40 for legs and wings (remove the pieces as they are done cooking). When the chicken is done, give the carrot mixture in the pan a stir; if the pan looks dry add 2 to 3 tablespoons water. Continue roasting the carrots until they are tender, about 7 to 12 minutes longer. 5. 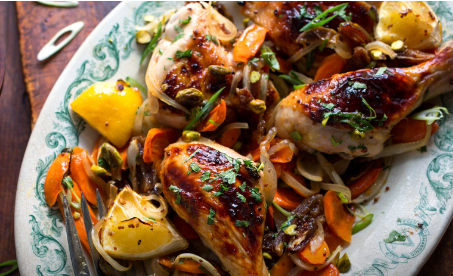 Spoon carrots over chicken and top with cilantro, scallions and pistachio nuts.